« THE SMITHE Vancouver Downtown Condo Tower by Boffo Launching Soon! Above All Else / Legacy Edition of The Cambie Collection by Pennyfarthing Homes. Elite Vancouver modern residences adjacent to beautiful Queen Elizabeth Park on Cambie Street are now previewing at the Pennyfarthing Hawthorne Condos. The midrise will be located at 4988 Cambie Street Vancouver Westside and the floor plans range between 1 to 4 bedroom layouts. The unit sizes are approximately 615 to 1,625 square feet and there is also an exclusive Penthouse Collection available. 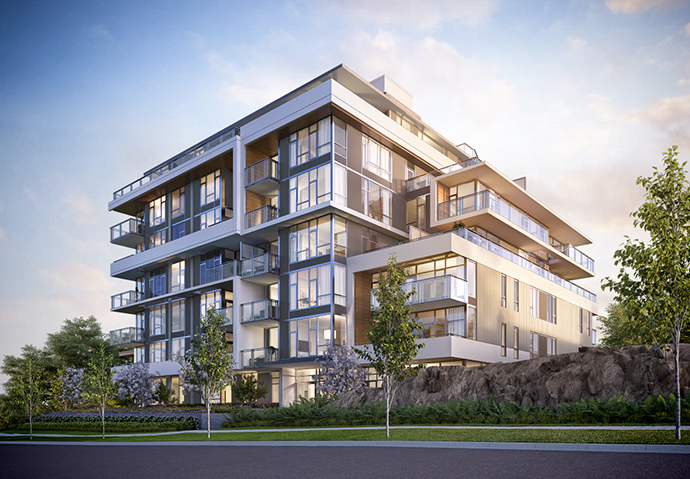 Located at West 34th and Cambie, the Westside Vancouver Hawthorne condos will be exquisitely finished and well designed for the exclusive buyer. There are only 44 opportunities in this boutique condominium building by Pennyfarthing Developers, who have a string of very successful luxury developments such as The Grayson and Bennington House. The Legacy Edition of Pennyfarthing’s Cambie Collection at The Hawthorne Vancouver is all about location location location. At seven storeys in height, it’s also the highest building in the Cambie Corridor, giving residents unparalleled views. The striking and unique façade is both timeless and modern and will feature extensive window glazing and progressive architectural elements. In addition, the modern homes at the Westside Vancouver Hawthorne condos will present over height ceilings and expansive windows in addition to modern kitchens with contemporary flat panel cabinets and premium Bosch integrated appliances. Some homes will even have exquisite marble counters and islands with waterfall edging. The bathrooms at The Hawthorne condos in Vancouver will feature quartz counters, rich wood cabinets and seamless glass shower enclosures. A special bonus is a 1,600 square foot rooftop terrace for resident use. Here, you will find great views overlooking QE Park, the North Shore mountains and even Downtown Vancouver. The Hawthorne amenity terrace will also feature a communal barbecue, dining spaces, shared garden and children play area. The Hawthorne Presentation Centre is located at 3373 Cambie Street Vancouver. For more details, please visit www.liveathawthorne.com today or simply fill in the online form above to get the latest information about pricing, floor plans and availability. Pennyfarthing Homes redefines contemporary luxury living with Hawthorne Vancouver. Now Selling. Rising 7 storeys above the park on Vancouver’s esteemed Cambie Corridor, this new benchmark for design features progressive modern architecture with bold elements and a striking façade. Generous floor plans are presented in 1 to 4 bedroom plans with distinguished interiors and meticulous finishes at the Westside Vancouver Hawthorne condos. Expansive glass and overheight ceilings offer sweeping natural light throughout the homes with unobstructed views from upper floors. Lifestyle is unmatched by the parkside setting and prime urban location. Enjoy outdoor leisure and recreation at your doorstep with every daily amenity within minutes. 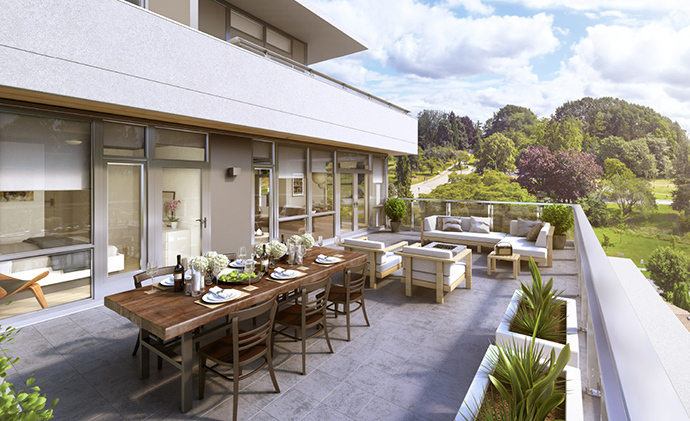 These highly anticipated Hawthorne Vancouver Westside homes are now selling. The presentation centre is located at 3373 Cambie Street and is now open by appointment. 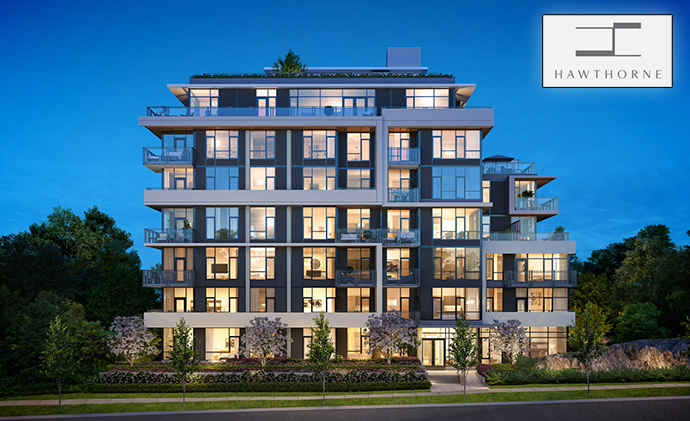 Contemporary design and bold architecture intersect as Pennyfarthing Homes introduces Hawthorne – The Legacy Edition of their distinguished Cambie Collection situated along Vancouver’s esteemed Cambie Corridor. A new benchmark for luxury living rising 7 storeys above the park, these 1 to 4-bedroom homes are marked by meticulous finishes and tailored detailing. Expansive windows offer sweeping natural light throughout homes with unobstructed views from upper floors. Situated adjacent to Queen Elizabeth Park on Vancouver’s esteemed Cambie Corridor, experience a modern West Coast lifestyle of natural beauty, urban convenience and prestige. Outdoor leisure and recreation are at your doorstep with 130 acres of lush parkland and every daily amenity within minutes. Enjoy walking distance to an array of specialty boutique shops and grocers or dine on a gourmet meal at one of several award-winning restaurants lining Cambie Street and at nearby Oakridge Centre. A top education is offered at a number of high-ranking schools throughout the neighbourhood. Enjoy unparalleled accessibility to downtown Vancouver, Richmond or UBC through rapid transit and the Canada Line.